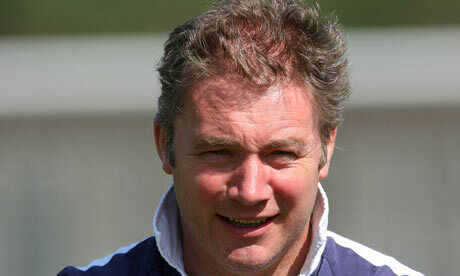 Ally McCoist has followed up his appointment as manager of Rangers next season by naming an all new backroom staff. The much beloved former striker has decided to rely heavily on friends from his past career to assist him in his first big-time managerial job. First team coach will be Rangers legend and drunken buffoon Paul Gascoigne, who is expected to bring a wealth of knowledge on drinking, drugs and ready-cooked chicken to the fairly young squad. We attempted to reach Gascoigne for his comment, but he was in a ditch in Bournemouth. Rival QoS captain John “The Entertainer” Parrott will be in charge of the reserve team and it is thought that is renowned safety game will greatly assist what is often a leaky defence in European competition – although the club’s owners have insisted the way to stop this is to be “less Scottish”. Working as physiotherapist will be Sue Barker, doing double duty rubbing down the players as well as screaming orders at them. Often at the same time. McCoist has insisted that his team will finish “at least second” next season, “probably” win one of the domestic cup competitions and “if they’re lucky” will be out of Europe by August at the latest.